The combustion of fossil fuels by humans contributes to the elevated concentration of atmospheric carbon dioxide, facilitating climate change. In 2017, the transportation sector released around 1.9 billion tons of carbon dioxide, supplanting electricity generation as the nation’s foremost source of atmospheric emissions, according to the United States Energy Information Administration. This shift was largely due to the shuttering of coal-fired power plants partly attributable to the ascent of improved photovoltaic solar panels, wind turbines, and other carbon-neutral renewable electricity generation means; the costs of which have significantly fallen over recent years. Unfortunately, the storage of renewable electricity using lithium batteries remains expensive whereas older storage battery technologies often involve environmental toxins such as the heavy metals lead or cadmium. Relatively few vehicles today are electric while most continue to depend on carbon-based organic chemical fuels like diesel or gasoline. 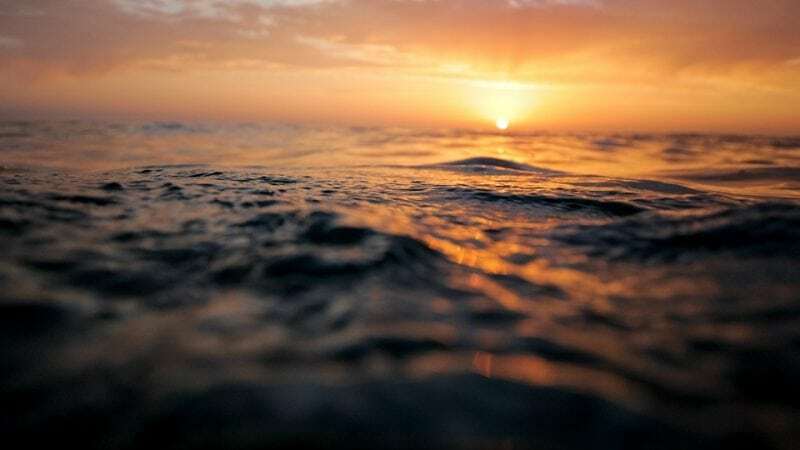 Microbial electrosynthesis is a swiftly developing technology that could, in the future, provide an alternative strategy for storing renewable energy within the chemical bonds of organic molecules. Microbial electrosynthesis employs an unusual group of microorganisms, collectively called electrotrophs, that can be cultivated using electrical energy inside specialized growth chambers called bioelectrochemical systems (BESs). Within these BESs, electrotrophic microbes convert inorganic carbon dioxide to reduced organic chemicals using electrode-delivered electrons to drive otherwise non-spontaneous biochemical reactions. Earlier work on microbial electrosynthesis research focused largely on Gram-positive Firmicutes bacteria or the use of mixed cultures which can be less amenable to study and genetic manipulation. Unlike the corn-based ethanol present in most of the US gasoline sold today or soy-based biodiesel, microbially produced chemicals need not compete with the domestic food supply. In a new study reported in the October issue of the scientific journal Bioelectrochemistry, researchers determined that a pure culture of the fully sequenced, Gram-negative marine bacterium Desulfobacterium autotrophicum HRM2 catalyzes the electrochemical conversion of carbon dioxide into organic compounds. In this study, electrochemical techniques were used to first demonstrate that the bacterium could take up electrons from a cathode electron source over an extended incubation period. Chemical analysis methods including gas chromatography (GC) and high-pressure liquid chromatography (HPLC) were employed to demonstrate uptake of carbon dioxide with the associated accumulation of the organic molecule acetate. Coupled with this increase in uptake of electric current a removal of gas phase carbon dioxide was documented in the gaseous headspace of the BES growth chambers. Db. autotrophicum is a marine sulfate-reducing bacterium that is metabolically well characterized and its genome has been fully sequenced. This microbe is able to grow on carbon dioxide and hydrogen in the presence of sulfate by using the bidirectional Wood-Ljungdahl pathway which is centered on a specific Ni-Fe carbon monoxide dehydrogenase (CODH) enzyme. According to lead author Zehra Zaybak, in a bioelectrochemical system, Db. autotrophicum was able to use electrons provided by a solid cathode surface to fix CO2 and to reduce it into mainly the organic molecule acetate. This molecule has a number of existing industrial uses. 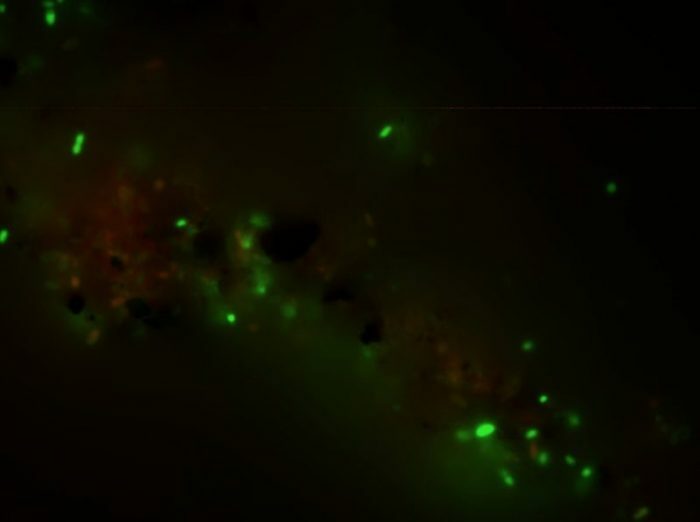 Epifluorescence microscopy of cells from the cathode chamber of the bioelectrochemical reactor indicated a majority of live cells using a commercially available live/dead staining kit which stains living cells green (Fig 1). Additional electrochemical analysis revealed a reversible redox couple suggesting the involvement of electron transfer facilitating enzymes at the cell surface of Db. autotrophicum HRM2. Based on these findings, this sulfate-reducing bacterium has the potential to serve as a model organism to help decipher the physiological and biochemical mechanisms of microbial electron uptake from electrodes. These findings are described in the article entitled Electrotrophic activity and electrosynthetic acetate production by Desulfobacterium autotrophicum HRM2, recently published in the journal Bioelectrochemistry. This work was conducted by Zehra Zaybak and John M. Pisciotta from the Pennsylvania State University and West Chester University of Pennsylvania, and Bruce E. Logan from the Pennsylvania State University. John is a research scientist at West Chester University in the Department of Biology. Current laboratory research projects include: Infectious disease research, Renewable energy, Bioremediation and basic studies into Microbial Physiology. Methods used include Gas Chromatography, spectrophotometry, chronoamperometry, molecular and cell cultures based methods.